The Vigorous Muscle Maximizer claims to help you gain “lean ripped muscle” in “just weeks”. How does it work and can you truly believe that this product works as claimed? If you are tempted by this offer then I would recommend that you read on. The following review will reveal the truth behind the hype. While these claims sound impressive the next thing you should ask is whether these claims are accurate or not? It is easy to write claims like this, but much harder to prove them. This is why you should spend a little time looking to see if there is any proof of these claims? For example, what ingredients does this product contain? 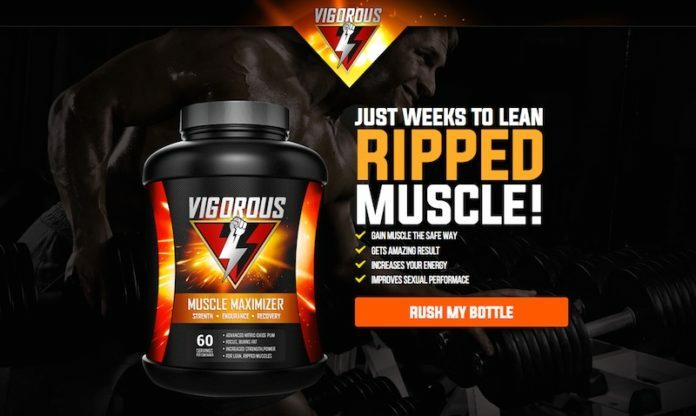 Most muscle building supplements will avoid revealing their ingredients, so it is refreshing to see that Vigorous Muscle Maximizer has a label with dosages available to view. The ingredients used include Niacin, Beta Alanine and various amino acids such as L-Arginine and L-Citruline. These ingredients will likely provide the benefits that have been claimed. From looking at the website it is clear to see that this product is available for trial, but what does it cost? These offers are rarely as affordable as you may think. To discover the true cost you should spend a moment or two reading the terms and conditions, which can be found by clicking the link found in the footer of the website. These T&Cs reveal a $4.95 charge when you first sign up to the offer. Then a second charge of $89.95 at the conclusion of the 14 day trial period. It is also revealed that should you fail to cancel the trial within this 14 day period you will be automatically added to an auto-ship program. This means that every month after you will be sent another package along with a bill for the full amount. These shipments will continue until you contact Vigorous Muscle Maximizer to cancel the subscription. Is the Vigorous Muscle Maximizer a scam? Looking at the ingredients I can certainly see some benefit to using this product. Unfortunately, due to the cost involved there is no way that we could recommend this offer. There are plenty of alternatives available that are much more affordable, and that do not rely on auto-shipping to trick customers out of their money. I would suggest that you opt for one of these alternatives instead of wasting your money on this offer.